Having spent time on the Moroccan paintings I needed to see if I could apply the techniques to an original painting. Of course the subject matter was the big question. One of the thoughts going through my mind about composition is what if I’m stuck with a mundane subject in the field. So I wanted to take a fairly average, still sympathetic subject to paint and ‘discover’ a painting with in it. 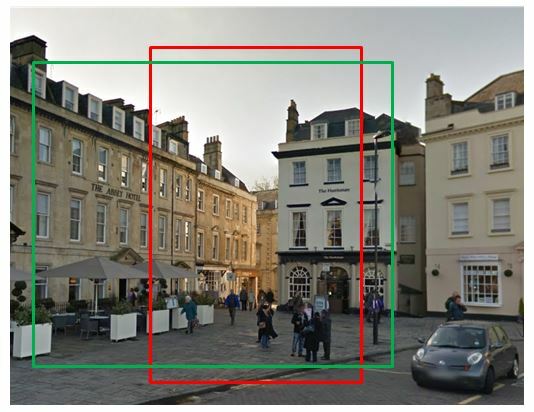 I found this picture of Bath and looked at possible compositions. Two of the most obvious are marked on the photo. I felt the portrait version (red) was worth taking forward. It had interesting light and not so many windows. 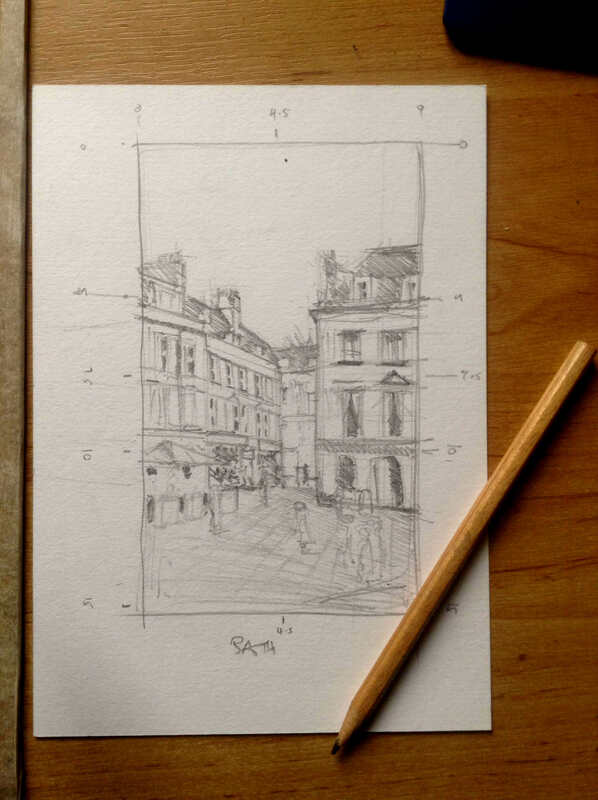 So I made a sketch of the scene to understand the composition more, identifying tone, depth and detail. This was also very valuable in identifying angles and dimensions. There was a lot of pavement and this would be broken up by people and perspective lines but from a balance point of view this worried me. I moved to the next stage by drawing the scene on to watercolour paper. 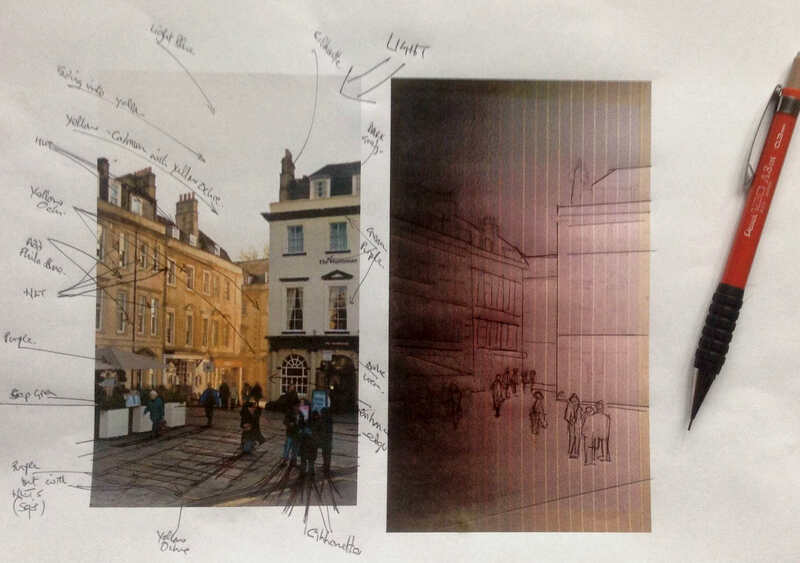 To check angles and dimensions I printed out the line drawing against the original photo. Even after doing this I made several key errors on the drawing which I din’t find out until I was well into painting. The final painting is below. For me its still not quite to my taste. 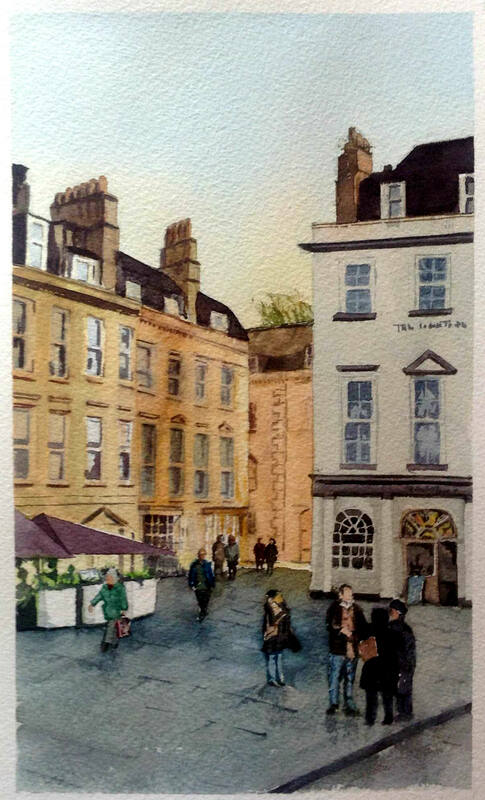 Its a useful study and I will have learnt things but the composition is a little boring, the balance is not quite right, the perspective is out in places and the colours are not fresh enough. There is not enough interest in the darks and not enough life in the lights. Have I progressed from the Moroccan paintings? Not really, I’ve used some thoughts about the use of the buildings and people, but not enough to make a difference. Keep pressing on….